Indian Wedding Fashion. In this post we will be discussing the latest trends for bridal fashion in India. This year we have seen brides breaking the typical stereotypes and going for new things. So I would say that this is the year of innovation and experimentation for Indian brides. If you are planning your wedding this year, or attending one or planning a function one for your loved one, then you are at the right place. My first suggestion to you would be to not hesitate, if you have an idea, no matter how different or crazy it sounds, go for it and you might be the next trend setter. This year the natural sort of make-up is likely to be in greater demand. Though Indian brides have traditionally gone for the bold and bright look, now is the time for a more natural looking base. Another interesting trend is of wearing the winged eyeliner. Specially when combined with bold lips, the winged eyeliner creates the perfect bridal look. Here are Top 10 Bridal Makeup Ideas For Women with Dark Skin, for a Stunning Look. The traditional heavy jewellery look is no longer recommended by most designers. It is suggested that you go for a reasonable amount of jewellery instead and make the most out of it by ensuring its uniqueness and beauty. 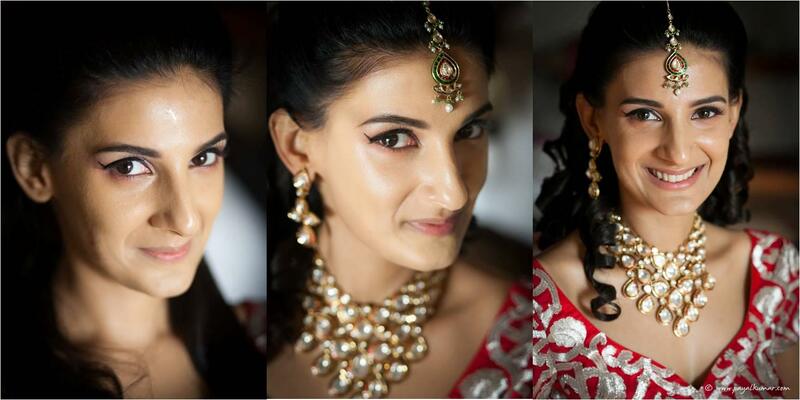 My favourite peace of jewellery for the Indian brides is the maang tikka. What makes them so interesting is the number of ways you can wear them. There are just so many different styles like the flat pendant, the spherical one, the side jhoomar or tikka with side layers. I would suggest that when you go to the jeweller, you try all the different designs to choose the one that best suits you. Or you could go for a different style on all the three to four wedding days. Have a look at 18 New Maang Tikka Styles for Different Face Types. Indian brides have historically gone for bold colours,there is no doubt that the bold colours like red, orange or pink create lovely brides. But this year pastel shades have been gaining immense popularity amongst Indian designers and brides and they create fabulous lehngas and other traditional dresses. For example the mint green and Caribbean blue colours make spectacular brides. If you want you can even mix up these pastel shades with a bold one and create a new combination. Here are some more ideas for bridal looks that you can use. Just remember these simple tips and there’s no doubt that you will be able to arrange that fairy tale wedding you always dreamed about!From following collection of images you can get your own wedding outfit ideas and make a perfect combination to make your big day memorable. Bridging the gap between traditional and modern, the simple yet classical mehndi look. Here are 14 Cute Mehndi Makeup Tips and Mehndi Makeup Tutorial. Latest Style Indian Wedding Lehnga -A beautiful multi coloured lehnga in neon shades, while the groom wears a neon coloured scarf to match the bride’s look. A beautiful pastel coloured dress, white and baby pink, the perfect combination for a reception event. If you love pastel colors, here are 18 Cute Pastel Outfit Combinations and Ideas to Wear Pastel. Soha Ali khan looks absolutely ravishing in her gold & orange Sabyasachi lehenga with gold choker and a side matha patti. The latest Indian fashion trends include outfits that are draped or incorporate some sort of a wrap design. For instance, have a look at this outfit by “The Label Rose”, which is a Mumbai based brand. The outfit includes a stylish drape and it can be used by both wedding guests and brides. The colours for this outfit too give off really elegant vibes with a touch of serenity – peach and gold is surely a classic colour combination that never fails. When talking about Indian weddings, one can never ignore sarees. The saree for the bride has to be just the right amount of fancy and yet not too over the top. Have a look at this saree design, while the solid royal blue colour of the blouse and pallu keeps the look simple enough, the embroidered part of the border adds the bling that one needs for a wedding function. Moreover, a saree like this would always be much more economical than a fancy one that’s filled with embroideries or crystal work. Here are 14 Most Elegant Saree Designs, with the best tips and ideas. Take cues from the gorgeous Sania Mirza who dressed up in a beautiful lehnga style gown, designed by “Varun Bahl Couture”. In Indian clothing vocabulary, this is an “anarkali dress” and is usually paired with a churidar salwar. Sania Mirza looks drop dead gorgeous as the pink and red floral motifs really compliment her. The hairstyle is also a good choice as it helps her show off her statement earrings. And since we’re talking about sibling’s weddings, here are all the looks that Sania rocked for her Sister’s wedding in November 2016. If you’re thinking of wearing a lehenga then remember that there are a number of different lehenga styles so be sure to choose one that looks best on your body shape. Here are the complete tips on How to wear Lehenga for Beginners in 10 Stylish Ways. It’s always a good idea to go for a combination of different fabrics and textures to create a breathtaking outfit. For example, have a look at this royal outfit created by using velvet and net. Don’t miss out these 20 Wedding Hairstyles for a Perfect Looking Bride. A fusion of the West and the East always creates magnificent outfits. Check out this wide legged jumpsuit with a front cape and wing sleeves, designed by “Aashni & Co.” It’s perfect for any small wedding function as well as for formal wear. White, Off-white and Ivory white are our favorite colours for the wedding season this year so do give them a try. The traditional wear of Indian bridal increases the beauty of a woman. Here I found some of the best bridal outfits. Your creation on bridal lehenga is fabulous.